The new issue of Palookaville, the long running comic by Seth, is out. He and his publisher have made a strategic decision to stop releasing it as a comic book--now it's an annual book. So in addition to the main story (the serialized Clyde Fans), Seth is responsible for filling a lot of extra pages. In this issue, we get some amazing pages from his sketchbook, a personal story, and several pages devoted to a pair of art exhibits that Seth did. Seth tells the story of the fictional town of Dominion in this issue--I highly recommend you pick it up to read the whole thing. 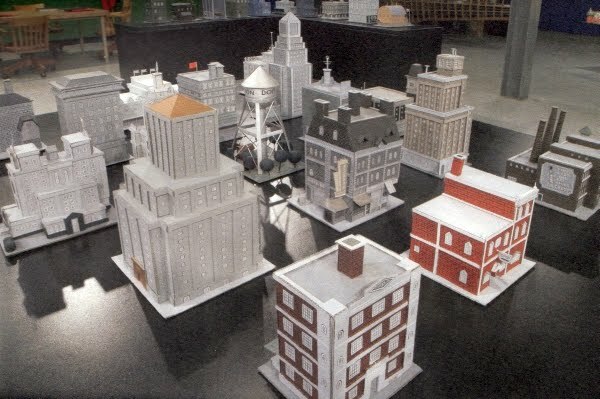 But briefly, Seth began making model buildings out of cardboard, a hot-glue gun, and housepaint. He described it as a project for a man of a certain age (think of Bobby Bacala's train set from The Sopranos). 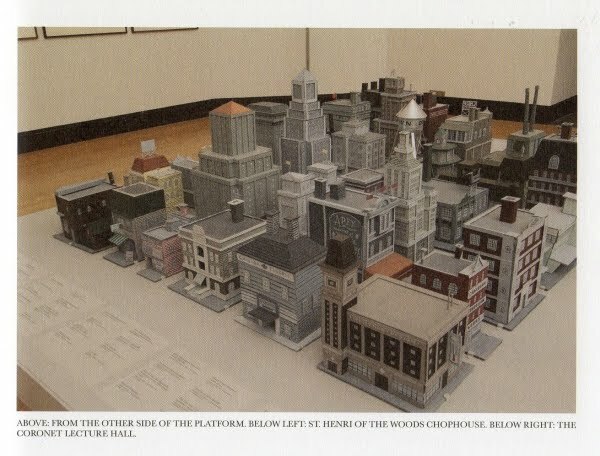 He wasn't thinking of it as art, even though anyone familiar with Seth's work would 1) instantly know these buildings were made by him because of his distinctive style, and 2) recognize them as a part--maybe even an integral part--of the entirety of his art. He gets a call from Ben Portis, a curator at the Art Gallery of Ontario. Portis's suggestion is to display art by comics artists alongside with art by other artists who have "pop" sensibilities. This is almost always the first instinct of curators when approaching comics art (except for those who actually skip the comic art all together and just display art by gallery artists who have been influenced by comics). Portis's heart was in the right place, but Seth rightly turned him down--that wasn't an idea that appealed to him. So Portis suggested instead a solo exhibition (an offer that is guaranteed to delight an artist). He went to Seth's house and saw the town of Dominion in the basement and suggested including it. At this point, you see Portis's brilliance as a curator. Portis was also able to look past the words "cartoonist" and "comics" and recognize that Seth was an artist. The way he expressed his art was important, but not essential. So the first Dominion show went up in 2005. Now this show wasn't so much an installation--it included Dominion but also a lot of other Seth artwork that wasn't related to the town. 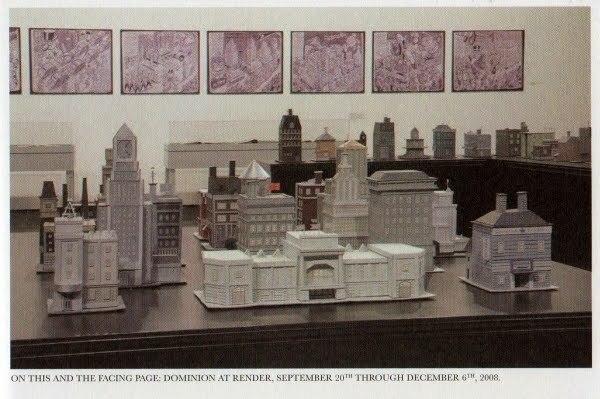 But another curator, Andrew Hunter, thought that Dominion could be its own thing. In 2008, he had Seth install a Dominion "Hall of Records" in the Render gallery at the University of Waterloo. 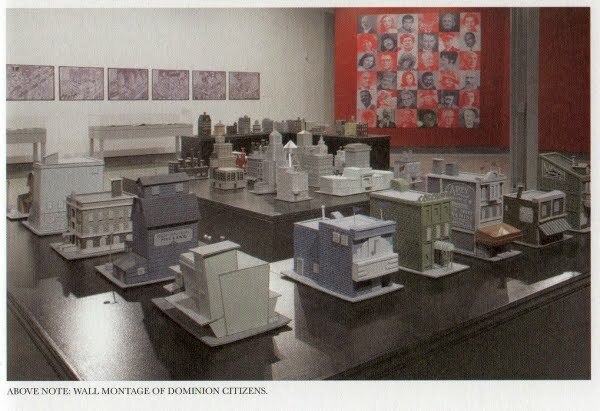 In addition to the town model, Seth created additional artifacts of the town--portraits of residents, the office of an archivist (file cabinets, etc.) and more. Now when I talk about doing exhibits with comics artists, this is what I have in mind. I want to think of them not as comics artists, but as artists. That means that whatever they do might conceivably be part of an exhibit dedicated to their art. Some cartoonists really only draw comics (and there's nothing wrong with that). But a lot of them do much more--comics is one aspect of their art. Maybe the most important part, maybe not. Anyway, Andrew Hunter and Ben Portis were open-minded enough to realize this with Seth. They enabled him to take his obsessions--which Seth himself wasn't thinking of as "art"--and expand his expressive means. The result was beautiful.